We, "AREAS", collaborate with local public organizations, industries, and community members to research underlying regional issues, and propose solutions with academic resources for the better regional society. 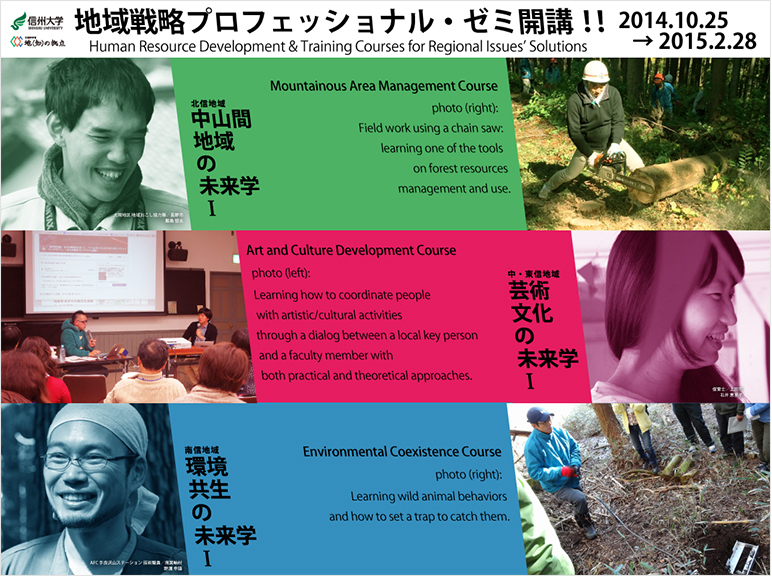 AREAS：The Center for Advanced Regional Strategy in Shinshu has started on October 1st, 2013 as an organization for promoting university engagement with our local regions and communities. Our mission is to produce human resources and solve regional issues that contribute to the next generations of Nagano Prefecture. To achieve our mission, we facilitate practical education (e.g. on-site problem solving learning activities) and Nagano-oriented research using local environment, personnel, and other resources. In addition, we develop a comprehensive cross-disciplinary network of experts as our academic leverage to apply to those issues to make our local society better. For this, we also ensure the engagement between Shinshu University and the local communities by frequently having an opportunity to communicate with local governments and residents about the future of Nagano. This is a joint research project with Nagano City commenced in 2013. 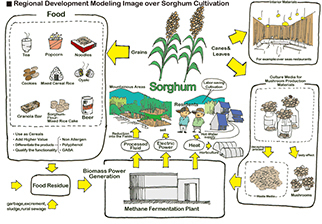 It is a practical research project aiming for regeneration and vitalization of a rural area by  growing a kind of crop resource in devastated or idled fields in a semi-mountainous area (an area between agricultural land and mountains), and  generating electricity from biomass using the crop as fuel. 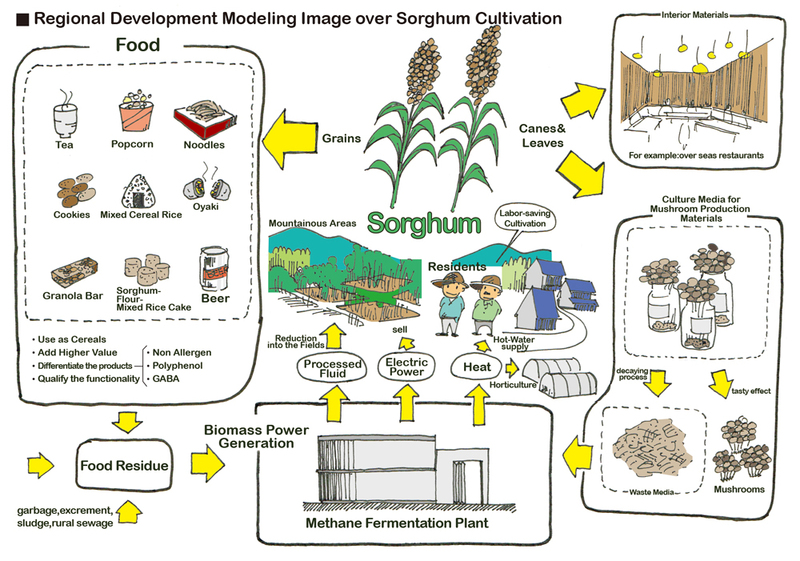 As a result of the feasibility study about the crop resource in 2013, Sorghum (millet) was selected, and at present we conduct the research and development for its multi-stage use. For example, the shredded stalks can be used for mushroom culture, and then produced biogas from mushroom medium waste can generate electricity; it is expected to be used in several stages both as raw materials and as a heat source, as well as electrical power. Additionally, the grain is allergen-free, so it can be used instead of wheat flower in bread, noodles, confectionary, etc. In recent years, food allergies have become a social problem, so it is expected to be applied in school lunches, health foods, etc. However, modeling such a resource recycling industry needs continuous co-operation with local communities. Further, on this research focusing on a semi-mountainous areas, we investigate how agriculture × commerce × industry × civilian collaboration can drive the next generation community. COC is a subsidy for enhancing region-oriented research and educational activities to promote university engagement. 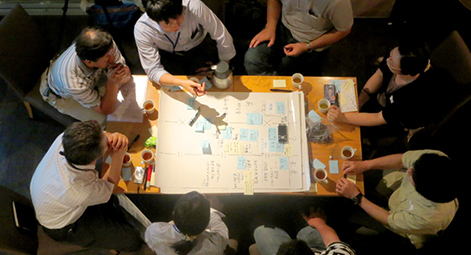 Our COC project called "Shinshu* Academia" aims to form comprehensive knowledge cycling system for local solution and human resource development. On this project, at first, we communicate with our local communities to research and set the future challenges for Shinshu such as the matter of continuity on semi-mountainous communities and the need of building a community with an environmental management system for co-existence with wild life, etc. Then,  we develop problem solving knowledge with a fusion of experiential knowledge from local community members and theoretical knowledge from the university. The results are [2-1] organized into relearning curriculums for local members, and produce seminars for nurturing human resources who can manage or lead their local communities. [2-2] For university educational program, we invite personnel from engaged local governments and those who finished with our seminar as lecturers to produce the classes learning about real local issues. In this way, the local personnel and the university can mutually learn deeper and experience more, and that activates human exchanges among the local communities and the university. This is our university's COC project "Shinshu Academia" that leads to create Shinshu University "Forest of Knowledge" platform: the comprehensive knowledge cycling system for local solution and human resource development that our university is driving for. * The old name of Nagano Prefecture. It has been 1 year since AREAS started on October 1st, 2013. In order to work as a university-wide organization, we have deployed an appointed researcher and administrative staff at each campus of the university. In this way, we have started to create effective links beyond faculties, campuses, and distance. However, it is difficult for one staff per campus to cover everything. We definitely need the faculty members to know and support AREAS. Additionally, it is necessary for AREAS to be more widely known in the local communities as the contact point for liaison with the university. Traditionally, individual member of faculties used to make liaison with others, but regional issues are getting more complex day by day. Now lays AREAS: we are for these issues. We shall actively communicate with our local communities and hand out our information to ensure the network between the region and the university. Considering the matter of university management, it is very important for us to put academic value on where we are located. It leads to strengthen the brand identity and clarify the position of our university as a national university. For this, AREAS: The Center for Advanced Regional Strategy in Shinshu aims to be a new university model with a specific education and research cycling system engaged with our local communities to activate and contribute to Nagano. Through these activities, we create Shinshu University "Forest of Knowledge" platform which is the objective of the Center, COC-project, and the vision of Shinshu University.